1 night Maun, 2 nights 3rd Bridge area (northern Moremi), 2 nights Magotho (Khwai river) & 2 nights Savuti (Central Chobe). Day 1: We will pick you up anywhere in Maun and transfer you to “The Old Bridge” and check you in to an en-suite tent for the night for dinner bed and breakfast. Day 2: Meet after breakfast at around 8:00 and have time for a quick cup of coffee or tea in a wonderful riverside setting while meeting our guide to discuss the safari. We depart from there in our safari vehicle for the drive to Moremi, driving time varies a bit depending on the condition of the road, it usually takes an hour before you start viewing game and about 1 hour 45minutes before reaching Moremi South Gate. We then head to the West onto the open plains of the “Black Pools” area for a 7 hour game viewing drive en-route to camp. Our guide will choose a good shady place to stop and set up our picnic lunch. This area boasts some classic seasonal and permanent swamp landscapes and is a good area in which to view Cheetah, Buffalo and Wild dogs. We arrive at our site near 3rd Bridge late afternoon to find our mobile safari camp set up. On each day that we transit from one site to another our crew drives ahead to move and set up camp before our arrival. The sites we use are all exclusive operators sites that are not shared with other groups. The tents we use on this safari are 3m x 3m walk-in dome tents, each one has one or two comfortable stretchers with bedrolls depending on whether you are sharing or not. Each bedroll is made up with a fitted cotton sheet, duvet and pillow. Each tent has an attached canvass enclosure to the rear with its own shower and toilet area. After we have arrived at the camp and have been shown to our tents to settle in our staff would have organised some warm water for the showers and will have the preparations for a three course fire-cooked meal underway. Day:3 On this day we go out for a full day game drive exploring the intricate network of game drive roads in Moremi with a packed picnic lunch. We stop at the Mokoro staion at Mboma Island for a 2 hour mokoro ride for those of us who wish to spend a little time gliding along some of the Okavango waterways. Day 4: Our wake up call is at 5:30 for tea or coffee and cereal, we then go out for a 2 hour game drive arriving back by 8am for a cooked breakfast. By 10am we depart from 3rd Bridge for a slow gameviewing drive through the north of Moremi to Khwai. This will take up most of the day as we can then visit areas such as “Dead tree Island” and “Dombo hippo pools” with a picnic on the way. Our crew will have time to lable our tents and bedrolls, dismantle camp and get ahead of us. We will arrive at our site at Magotho in the late afternoon to familiarise ourselves with our new bushcamp. We can then take a short drive down to watch the late afternoon and sunset unfold over the Khwai river before enjoying our third night around a campfire. Day 5: On our full day in Khwai we will go on a very early to mid morning game drive and spend the middle of the day to mid afternoon resting in camp. We will then go out for an afternoon and evening game drive with a little night time gameviewing for the chance to spot nocturnal animals. We will arrive back for dinner around 8:30pm. Day 6: Our wake up call is at 5:30 for tea or coffee and cereal, we then go out for a 3 hour game drive arriving back by 9:00am for a cooked brunch. By 10:00am we depart from Magotho for a last meander along the Khwai river to give our crew time to pack up and move on. We then head for Chobe South Gate and on to Savuti for some afternoon game viewing. Savuti is famous for the full array of preditors that inhabit its wide open landscapes. In such a dry landscape they are here to hunt animals drawn to the waters of the Savuti channel which flows from Linyanti to the Savuti marsh. Day 7:Our wake up call is at 5:30 for tea or coffee and cereal, we then go out for a 5 hour game drive arriving back by 11:00am for a cooked brunch. After brunch and a couple of hours in camp we head back out for another game drive from 2:30pm to sunset. Arrive back in camp at last light for our last campfire feast on this safari. Day 8: Wake up call at 5:30am Coffee/tea and a cooked breakfast. Depart camp at around 7am for a 5 hour drive to Kasane including a last look around the Savuti area on our way. We then end our safari in Kasane at around 12 o’clock at “Coffee Buzz”, next door to the “Kalahari Tours” office for your transfer to Victoria Falls, or to start your northern Chobe Safari. 2 nights Savuti (Central Chobe), 2 nights Samahundu (Northern Moremi) & 1 night Maun. 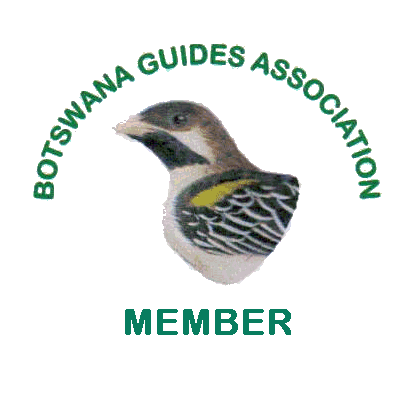 Day 1: Meet our guide at “The Coffee Buzz”, next door to the “Kalahari Tours” offices in Kasane at 12:30pm for a briefing on our safari to Maun through the parks. From there we board our safari vehicle and set off for Savuti arriving there at around 5pm to find our camp set up ahead of us. After we have arrived in Savuti and have been shown to our tents to settle in we then go on a late afternoon game drive, arriving back at last light. Our staff would have organised some warm water for the showers and will have the preparations for a three course fire-cooked meal underway. Day 2: Our wake up call is at 5:30 for tea or coffee and cereal, we then go out for a 5 hour game drive arriving back by 11:00am for a cooked brunch. After brunch and a couple of hours in camp we head back out for another game drive from 2:30pm to sunset arriving back in camp at last light. Savuti is famous for the full array of preditors that inhabit its wide open landscapes. In such a dry landscape they are here to hunt animals drawn to the waters of the Savuti channel which flows from Linyanti to the Savuti marsh. Day 3: Our wake up call is at 5:30 for tea or coffee and cereal, we then go out for a 2 hour game drive arriving back by 8:00am for a cooked breakfast. By 9:30am we depart from Savuti for Chobe South Gate leaving the park by 11:00. An hour later we enter the Khwai area and spend the next few hours gameviewing along the Khwai river during which our guide will choose a good shady place to stop and set up our picnic lunch. From there we enter Moremi north Gate and head westwards. We will arrive at our site at Samahundu in the late afternoon to familiarise ourselves with our new bushcamp. We can then take a short drive down to watch the late afternoon and sunset unfold over the Khwai river before enjoying our third night around a campfire. Day 4: Our wake up call is at 5:30 for tea or coffee and cereal, we then go out for a 3 hour game drive arriving back by 9:00am for a cooked brunch. By 10:00am we depart from Magotho for a last meander along the Khwai river and will then head for Moremi North Gate. From there we drive along the northern boundry of Moremi stopping for a picnic lunch on the way. After we have arrived in Samahundu and have been shown to our tents to settle in we then go on a late afternoon game drive and visit areas such as “Dombo Hippo Pools”, arriving back at last light. Day 5: Our wake up call is at 5:30 for tea or coffee and cereal and a full cooked breakfast we depart before 7am for a slow 6 hour gameviewing drive through Xakanaxa, past dead tree island and down to western open plains of the “Black Pools” area. Our guide will choose a good shady place to stop and set up our picnic lunch. This area boasts some classic seasonal and permanent swamp landscapes and is a good area in which to view Cheetah, Buffalo and Wild dogs. We will then depart to South Gate arriving there at around 3pm for a 1 hour 45 minute drive to “The Old Bridge” in Maun. Check into an en-suite tent for dinner, bed and breakfast. Day 6: After breakfast we will arrange a transfer for you to anywhere in Maun. Two night Chiefs Island Okavango boating safaris Nxaraga lagoon. July 14th, 16th, 21st, 23rd, 28th & 30th. August 6th, 11th,18th, 20th, 25th & 27th. September 1st, 3rd, 8th, 10th, 15th, 17th, 22nd & 24th. Day 1: We will pick you up from your place of accommodation in Maun and transfer you to “The Old Bridge” getting you there by 8:00am. We will then have time for a quick cup of coffee or tea in a wonderful riverside setting while meeting our guide to discuss the safari. We then depart from “The Old Bridge” at 8:30am by motor boat, first on the Thamalakane river then up the Boro river. After the first hour passing through a rural area we then cross the “Buffalo fence” and enter the wildlife area of Okavango Delta. Our next few hours are spent game and bird watching while navigating the reed channels of the southern Okavango on our way up to Chiefs island. We will stop to have a light lunch of cold meats and salads and a short walk to stretch our legs en-route. After lunch the tender boat with staff and our camping equipment will move on to start setting up the camp ahead of our arrival. The sites we use are all exclusive operators sites that are not shared with other groups. We arrive at our camp at Nxaraga lagoon (19*33’42.21″S 23*12’23.32″E) at around 4 pm, settle in and take a rest in the shade at our picturesque campsite. At around 5pm depart on foot with a guide for a short 1 hour game walk around Nxaraga island to stretch our legs. Arrive back before sunset which we enjoy from the boat on the middle of Nxaraga lagoon, probably with a Hippo or two. Arrive back shortly before dark to a warmed bucket shower and a hearty campfire cooked 3 course dinner. 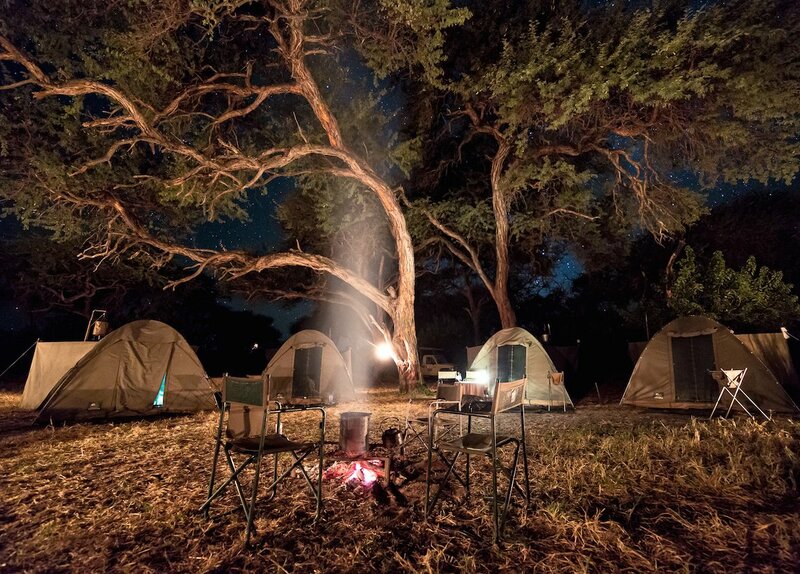 Retire at your leasure to your tent to fall asleep to the sounds of the Okavango. Day 2: We wake up around 6am, have coffee/tea, cereal and a cooked breakfast and then set off at 7am for a 1 and a half hour boat ride to Xaxaba village to meet our mokoro polers. From 9am to midday we go out with our mokoro polers for a 3 hour combination of mokoro poling and walking. From midday we boat further upstream for birding and game viewing in the Jugujugu area for a picnic lunch. Arrive back at Nxaraga campsite in the late afternoon for a shower and campfire dinner. Day 3: We wake up around 5:30, have coffee/tea and cereal set off shortly after 6am for a 20 minute boat ride to a point from which we can go on a two and a half hour guided game walk. Arrive back at 5pm at “The Old Bridge” in Maun. From here we say our goodbyes and transfer you to your place of accommodation.